From casual walks in our neighborhood to travels around the world, our Stokke Xplory stroller has proven itself ergonomic, versatile and comfortable. Now we don't travel without it! People always told us that life changes when you have a baby. What no one ever mentioned was how much TRAVEL changes when you have a baby! Aside from the obvious stresses of traveling with a baby (feedings, crying, naptime, etc..) there are also a whole range of things that need to be carried along with you - from the critical items like diapers, clothes, and food to the just in case items like toys, medicines, and even more clothes! But by and away the most important item we now have to bring along with us is our baby stroller. However, shopping for a stroller was a challenge that we had no idea how to tackle. We knew that a stroller was going to be one of the most important purchases we were going to make for Axel, so we wanted something that would be very comfortable for him (as he was going to be spending a lot of time in it), that was easy to travel with (we travel several times each month), and also looked good. To be honest, as first time parents, we didn’t have much experience with strollers. It wasn’t until we really started watched stroller reviews one YouTube, read plenty of Mommy-blogs and visiting a few shops that we could start to see the difference between stroller brands, makes and models. Some strollers are massive, some feel really chintzy, while others are just overly cutesy. To say there are lots of options is an understatement. One brand that kept standing out to us was Stokke. Their strollers’ were sleek and modern looking, and could even be adapted to Axel as he grew. They seemed to check all of our boxes for function, durability and style that we were looking for. The more we looked into Stokke, the more we liked that it was designed to adapt to children as they grow. We were really surprised to learn that children need multiple types of seats for the stroller. 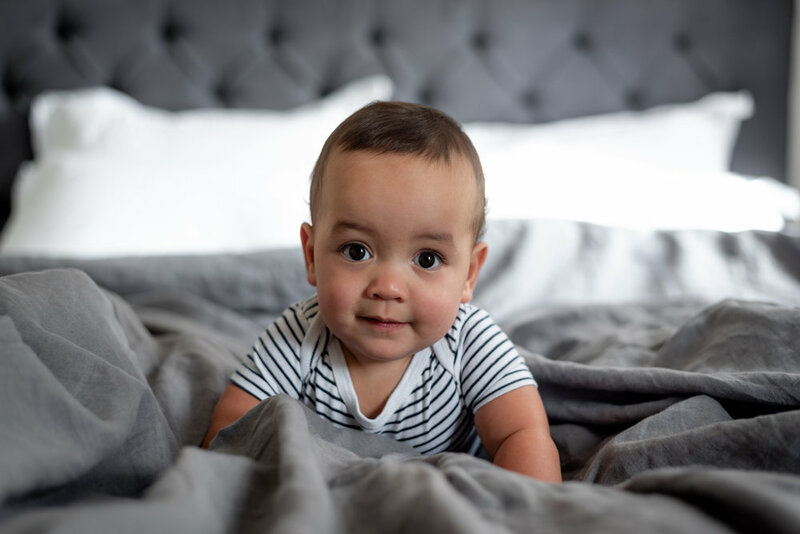 For instance, newborns need to have a bassinet where that can lay flat, whereas older babies and toddlers need to have a seat where they can sit up more vertically. Add to that you need a car seat -- and not just one car seat mind you, you need a car seat specially sized for newborns and infants, another for toddlers, and finally, another for older children. Stokke was one brand that we found where we could use the same stroller for each type of seat. Honestly though, who knew babies needed so much stuff!? It’s been less than a year since we've had our Stokke stroller but it's already been all over the world. From the bustling metropolis of Dubai to the tropical forests of Sri Lanka to a cruise through the Caribbean. And so far it has not disappointed. Lets just get this out there -- The Stokke Xplory is definitely not the smallest stroller out there -- or the lightest -- but it breaks down and collapses to be small enough to fit into any car trunk. And while it's size makes getting it up and down the narrow staircase at our home in Amsterdam, once we have it outside it's a whole different story. It's easily maneuverable, with a really small turning radius which is very useful in tight spaces...like turning around in a subway car or train :). It's wheels have a subtle rubber padding to them which means that Axel gets a smooth ride whether he's on pavement, the cobblestone streets found throughout Europe, or even a little bit of off-roading. And when we need to, we can easily collapse the stroller for in under 20 seconds. The seat is easily removed, and you can literally "fold" the stroller by pulling on a lever, which makes the stroller small enough to be carried in one hand, or, be placed into any car trunk. We will admit that we've received more than a few curious looks from people as we walk the stroller through the airports. First, you don't see many infants traveling, and second when you do they are surely not in a full size stroller like this -- and that’s a shame, because we found the Stokke Xplory to be be extremely helpful at the airport. It gives axel a familiar places to relax (and hopefully sleep) while we check into the flight. Once we head to security, we simply take Axel out, break down the stroller and out it through the x-ray machine just like we do for any other carry on item. And when its time to board the plane, we fold the stroller back up, place it in the Prampack (more on the in a second) and "gate check" it right as we board the plane. Honestly, it couldn't be easier -- and best of all, most of the time the stroller is waiting for as we get off the airplane, so we can put him right back in while we go to collect out luggage. It really makes our time at the airport simple, and far more convenient that trying to carry axel. So back to the PramPack that i mentioned above. Essentially, the PramPack is a fabric case that wraps around the stroller and keeps it safe and secure when the stroller is checked into the the cargo hold of the airplane. The pram pack is super lightweight (like carrying a yoga mat), so it was easy for us to transport it and bring it around with us. I think we all are aware of just how "careful" baggage handlers are at the airport, so we were thrilled that Stokke offered this as a way of protecting the stroller from damage. We've had heard too many stories of airport handlers throwing around strollers and how they break, that I didn't want to chance it with our Xplory. So far, over 15 flights in, our stroller is still looking great and has not had any damage -- although given the condition of the PramPack, it certainly looks like its been through a war zone -- with many scuffs and scrapes covering the fabric. I can't even being to image the condition the stroller would have been in without the Prampack. The bottom line here is, if you’re planning to spend the money on a stroller like this, make sure to protect it while traveling! The PramPack may seem like a luxury -- but it’s probably the best thing we've purchased for it. A quick note about the “gate checking” the Stoke Xplory. Even though this is a large, full size stroller, every airline we’ve flown so far has always allowed us to “gate-check” it. This essentially means that instead of checking the stoller into the flight along with the rest of our luggage We were able to bring the stroller with the car seat up to the gate, and then fold all the pieces into the pram pack and check it in “at the gate” when we board the flight. This is a real lifesaver as it ensures that we don’t have to carry Axel through the airport -- then after the flight, the stoller is unloaded before the rest of the luggage and is normally waiting for us as we disembark the plane -- pretty cool! Even through the Stokke is very sleek and minimal looking, it does come with different accessories that add much needed storage space to it. We opted to get a grocery pack which sits at the front of the stroller (which conveniently fits Chris's camera gear when were on the road) and a diaper bag that attaches to the rear of the stroller. And if I can be honest the diaper bag is my favorite accessory! It’s super spacious, yet feels nice and small. It also comes with a changing pad, which conveniently tucks in the back. It’s also masculine enough for Chris to use too, without feeling like he’s carrying my purse. Speaking of accessories, the we picked up a few essentials like a rain cover, parasol, and even a footmuff which have all proved to be very useful because we live and travel in extreme climates. Winters in Europe are freezing with snowfall while the summers are warm and hot. For the winter, Axel was able to use the footmuff which ensured he stayed warm and cozy, without us having to bring multiple blankets and wrap him up in. For summer, we attach a parasol to the cot and he’s perfectly shaded… The rain cover has come in very handy during Amsterdams notoriously rainy days. The Stokke Xplory is sleek, slim, and has a minimalist look to it. The adjustable seat essentially means that Axel has a built-in high chair! He can sit high in his chair so we can make eye contact with him and eventually, we will be able to pull the stroller right up to our table so he can join us for meals. The infant carry cot allows the baby to lay down fully. It attaches easily to the base and can be used from birth. Having babies lay down is import to their development and it gives them the chance to start exploring their hands and feet. You can attach a car seat to the base. We needed a car seat, but didn't want to have to lug around a stroller and a car seat during our trips. The the Stokke car seat (iZi Go Modular) we bought can easily attach to the base of the stroller, making it a stroller/car seat combo. However, this car seat is only intented to be used by newborns and very small toddlers, so when Axel gets older we’ll need a new solution. With the push of a button you can easily remove the seats and then with a little pull the stroller breaks down. This was important to us considering we live on the 4th floor with no elevator, so we needed something lightweight and easy to carry up and down stairs. The accessories have proved very useful because we live and travel in extreme climates. Winters are freezing with snowfall and summers are warm and hot. For the winter, Axel was able to use the footmuff which ensures Axel stays warm and cozy, without us having to bring multiple blankets and wrap him up in. For summer, we attach a parasol to the cot and he’s perfectly shaded...although we don't really need it that much, as the sunshade that comes with the cot is pretty large. If you’re looking for a stroller that you can keep throughout your child's growth, from newborn on, (up to 45 lbs/20 kgs!) I can’t recommend Stokke enough. Whether we’re strolling through our neighborhood or traveling abroad, it has managed to keep up with us and keeps Axel secure and happy. The only slight issue we’ve had is that the Stokke isn’t super easy to lug up and down the narrow staircases of Amsterdam, but what it lacks in ease of staircase hauling, it makes up for in durability, style and comfort!